Doctor Who: The Moffat Scripts - THE ELEVENTH HOUR | Warped Factor - Words in the Key of Geek. Is Dr. Moo a threat to the Atraxi? 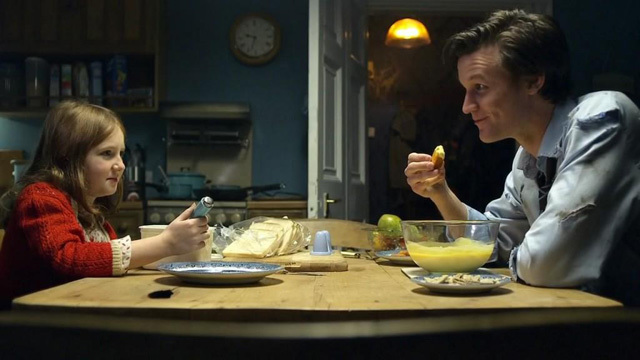 In a sense The Eleventh Hour can be seen as another reboot of the show, akin to 2005’s Rose. It has the task of launching a new Doctor, new showrunner, new production crew, new everything and prove to a sceptical fanbase that Doctor Who was capable of surviving without Russell T Davies or David Tennant. Suffice to say that this was no small task – that Steven Moffat passes the test at all is impressive, even moreso that he doesn’t just pass the test but passes with flying colours. Nobody’s going to convince you that this episode is anything less than 100% successful at establishing the new Doctor. Matt Smith sets himself apart from David Tennant instantly with a youthful energy that was inexplicably absent from Tennant’s portrayal. We see him throughout this story investigating a mysterious crack (more on that below) and the way he does it is so different from Tennant. While 10 would want to find out exactly what’s going on and checking every last detail 11, is happen to just run off and worry about it later. 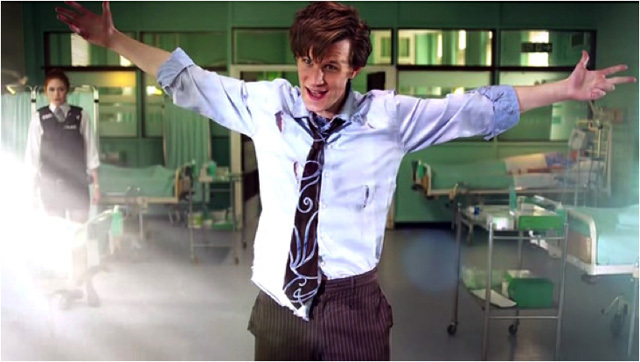 He’s much more spontaneous and Smith portrays the Doctor with a greater physicality – look at the way he leans forward when he meets “the good-looking one” for the first time or those early scenes when he adjusts to the “steering”. There’s also the social awkwardness on display throughout the story that we all love 11 for, but it’s downplayed on this occasion, later stories of series five will develop that further. We haven’t yet begun to peel off the layers as the credits roll on this story, but for a debut appearance this is a bloody good start that leaves us wanting more – which is exactly the way we should feel. He completely blows the audience away here; while the likes of Tennant or Eccleston were great they were just acting, but here Smith is THE Doctor. And then there’s the new companion Amy Pond. We’re introduced to her as a little girl who’s scared of nothing… except for the crack on her wall. Moffat’s made us fearful of statues and shadows, now that crack on your wall is added to the list. Again when Amy grows up we get another classic Scary Moffat Setpiece when she goes into a room she never noticed before to get the screwdriver. It just rolled under the door, right? Wrong! It’s on top of a chest of drawers… and there’s a monster behind her. 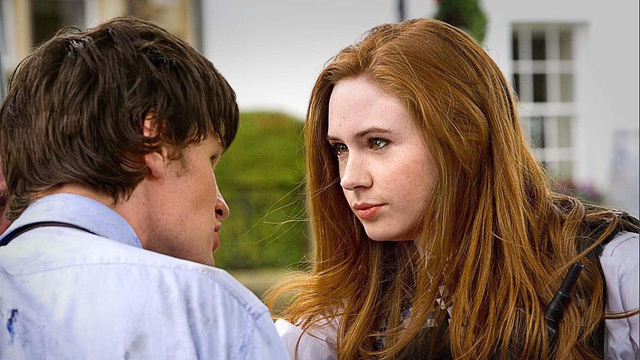 Amy is written inconsistently throughout series five – I suspect writers like Chibnall, Gatiss and Curtis knew her character only as “Fiesty Scottish Ginger” and credit where it’s due they did their best – but when you get a script from Moffat she’s believable, thanks in no small part to Karen Gillan. Like Smith, she has impeccable comic timing and puts these little touches into her performance that set her apart from her predecessors in the companion role. It’s the emphasis she puts on certain parts of certain words or the look she makes on her face, little things like that, which we never got with Billie or Freema. But below the surface there is a touching backstory. She meets the Doctor as a child and he becomes an imaginary friend, but now she’s grown up and her imaginary friend has come back. Just think for a moment how you’d respond to that if it happened to you. Gillan’s performance completely sells it, the pain, the longing, all of it. It says a lot about the influence the Doctor has on her – under an hour old and he’s already transformed her entire life! Certainly a clever way to establish the new companion and quite unlike anything the show had done before. Okay, so maybe Moffat is sort of repeating himself from The Girl in the Fireplace but who cares? It works just as well in 2010 as it did four years earlier, better even since he takes a more realistic approach this time. Instead of having a desire to start snogging the Doctor (not yet anyway – we’ll get to that in a couple reviews’ time) Amy is distrusting of the man who ran away from her all those years ago. She hasn’t had the chance to make much of her life, not even moving out of her childhood home, because she’s waiting for a man who ran out on her to come back. She even makes her boyfriend dress up as him! When the Doctor begs her to trust him, even for as little as twenty minutes, you genuinely wonder whether she will. That’s why The Eleventh Hour works. Steven Moffat knows we’re feeling anxiety to trust a new Doctor after David Tennant and so he asks us, begs us, to trust him and to give him the benefit of the doubt. If we do it pays off. But there are still some issues that hold it back from being perfect. Take the villains for example. Prisoner Zero is underdeveloped; we don’t know what it has done, why it’s on the run from the Atraxi, anything. It just… is. 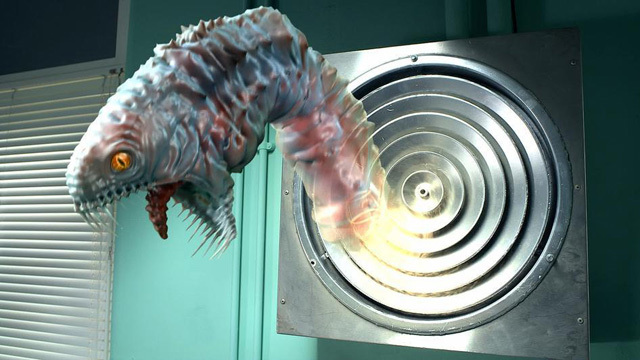 Making the villain a shapeshifter is a neat idea, especially as this is the way the 11th Doctor first finds out how he looks, but the potential of this concept is not fully explored as well as it could’ve been (see the Zygons) and despite setting up a high stakes Fate Of The Earth scenario with no resources for the Doctor it still proves suspiciously simple for 11 to succeed with the limited resources available to him. Add to this an underutilised guest star in Olivia Colman and the whole thing feels like a wasted opportunity, though on the plus side seeing a man bark like a dog or a little girl speak with her mother’s voice is a good way to send kids behind their sofa. But this is just a minor issue in an excellent story. Is there a single story in the history of Doctor Who that has literally zero problems? Caves has the cave monster, Genesis has the giant clam, Talons has the giant rat, Blink completely wastes David and Freema, The Day of the Doctor is occasionally spectacle over story… you get the idea. No Doctor Who story is perfect* so we can forgive if there are some minor issues like the ones I mentioned above. So putting minor issues like that aside, what should we make of The Eleventh Hour today six years on? Well, as a Doctor’s introductory story it works and as a standalone story – it works as well. The way it draws the audience to the 11th Doctor and Amy and gets you invested in finding out more about these characters is a masterclass for starting off, or, in this case, rebooting a TV series. With its compelling story, fantastic cast, exemplary soundtrack (“I Am The Doctor” is a musical masterpiece) and above all the dialogue, it all comes together in a neat hour-long package that invites you to keep watching, leaving you wanting more. It raises some questions with the obligatory story arc of the cracks and Silence that makes you to start thinking and speculate as to where it’s all going. In short it’s the perfect way to reboot the show, and now if I want to introduce a new fan to Doctor Who there’s no longer any question about it – I always start them here. After all, for me this is how it all started. This is the story that I happened to watch when it aired and I was hooked. This is where I became a fan. And I’ve never looked back. *Listen is, but we’ll get to that in due course.